After more than 20 years, the Devils have a new #1 between the pipes. Martin Brodeur has had his face hidden behind a New Jersey Devils’ goaltender’s mask since he made his debut in the 1992-1993 season and won the Calder trophy for Rookie of the Year a year later. In his two decade career, Brodeur has played in 70-plus games a dozen times. But when the Devils acquired Cory Schneider from the Vancouver Canucks prior to the 2012-2013 season, the writing was on the wall. Brodeur, in the last year of his contract, played in 39 games last season and recorded the second highest Goals-Against-Average (2.51) of his career. Schneider, by comparison, appeared in 45 games with a 1.97 GAA and stopped 92.1% of the shots on goal that he faced. As the 2014 trade deadline approached, Brodeur told the press he wanted to be a #1 goalie. While Devils’ President and General Manager Lou Lamoriello entertained trade offers for his future first ballot Hall of Fame goalie, Brodeur remained a Devil for the rest of the season. As of this writing, Brodeur is a man without a job. He feels like he could still help a team, but with the NHL opening last evening (Wednesday), a #1 job is not likely without an injury to a team’s top netminder. Meanwhile, the Devils have moved on with Schneider holding down the top spot and former Devil Scott Clemmensen back as the back up. It’s a huge opportunity for the 28-year old Schneider, who began his career as Roberto Luongo’s back up in Vancouver. The duo won the William M. Jennings Trophy, for least goals allowed, for the 2010-2011 season. Schneider played 25 games and recorded a 2.23 GAA (Luongo held opponents to 2.11 goals over 60 games.). With his future secure, Schneider can concentrate on playing 60-70 games a year. The Los Angeles Kings defeated the Vancouver Canucks in the first round of the 2012 playoffs en route to their first Stanley Cup championship. Down two games to none, then Canucks coach Allain Vigneault started Schneider over Luongo for the final three games. Schneider was simply outstanding, but the Canucks lost 1-0 in Game 3, and after a 3-1 victory in Game 4, lost 2-1 in overtime in Game 5 and were eliminated. Schneider held the Kings to 1.31 goals per game and stopped 96% of their shots. With Havlat and Cammalerri, Lamariello picked up good scorers, not great scorers. Cammalleri, in particular, will need to improve on his 26-goal, 19-assist performance of last season. The 32-year old hasn’t produced 30 goals since the 2008-2009 season, but the Devils need him to score between 30 and 35 this season. One of last season’s free agent acquisitions, Michael Ryder, will need to do the same. After putting the puck in the net 35 times for Dallas in 2011-2012, the right wing has slumped the past two seasons. The Devils can only hope that concussion-prone Ryane Clowe can stay healthy and return to his younger form. The Devils will also need 42-year old Jaromir Jagr to replicate his 67-point season – remarkably playing in all 82 games – and need more consistency from Adam Henrique and veteran star Patrik Elias. The Devils’ special teams also have to be at least as good as they were last when the team ranked 9th on the power play (19.5%) and were the number one penalty killing unit (86.4%). With Schneider in the nets and a solid defense (Andy Greene, Bryce Salvador, Marek Zidlicky) , the Devils should return to the playoffs, albeit as a wild card team. 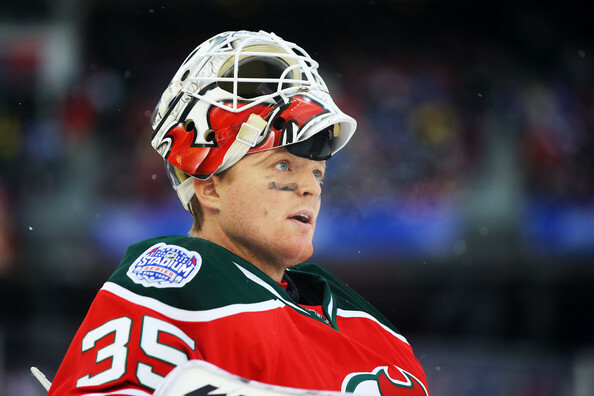 Brodeur and NJ, End of An Era? 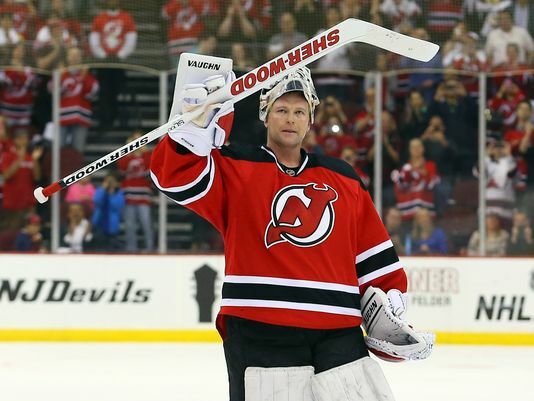 Martin Brodeur may have played his last game with the NJ Devils Sunday afternoon. Martin Brodeur pulled the red and black home uniform of the New Jersey Devils over his shoulder pads Sunday afternoon, for what could be the last time. The sure-fire NHL Hall of Fame member-to-be goalie is said to want to play one more year, but it’s not likely to happen with the team he has spent his entire 23-year career with. The Devils acquired goalie Corey Schneider from Vancouver last off-season to be their goalie of the future, but Schneider became the goalie of now when Brodeur struggled. The Devils #1 goalie for so many years, Brodeur argued that his poor play can be attributed to a lack of playing time. But which came first, the chicken or the egg? With the Devils moving forward, Brodeur is destined to sign a free agent contract elsewhere for the 2014-2015 season. The only way he would remain in NJ is if he can accept being the #2 goalie and is guaranteed, in some way, more consistent playing time. (He appeared in 39 games this season.) Another factor in Brodeur’s decision, is the possibility of returning to the post-season. The Devils have missed the playoffs the last two years, the first time that has occurred since the 1985 and 1986 seasons. During this season’s trade deadline, Brodeur was thought to possibly be on the move, but stayed put. Had he pressed the issue, he likely could have landed with another team, but also as a backup. The dilemma for Brodeur is whether to sign elsewhere and be unsure of playing time, or take a chance and finish his career in New Jersey. The latter could lead to another trade deadline decision in 2015. The future of coach Pete De Boer could also play a factor in Brodeur’s future. De Boer took the team to the Stanley Cup finals in his first year as coach in 2011-2012, but the team finished 19-19-10 in last season’s strike-shortened season and managed just 88 points this season. Brodeur started the last two Devils games this season, including an emotional season-ending game at “The Rock”, NJ’s home arena in Newark, NJ. For Brodeur, it’s all about one more run at the Cup. He hoisted Lord Stanley’s trophy in 1995, 2000, and 2003, but until two years ago, the team hadn’t gotten past the conference semi-finals since their last Cup win. Brodeur added to his NHL record when he got the win in the Devils 3-2 victory over the Boston Bruins Sunday. Here is a look at where Brodeur stands among his peers for single season and career records.